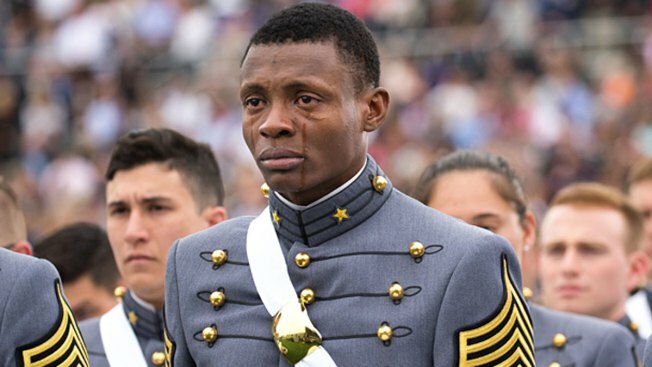 As 2nd Lt. Alix Schoelcher Idrache stood at attention during the commencement ceremony at West Point, N.Y., on Saturday, he was overcome with emotion. Tears rolled down both cheeks, but his gloved left hand held firm on his white, gold and black “cover,” the dress headgear that Army cadets wear. The photograph of Idrache, by Army Staff Sgt. Vito T. Bryant, was published Tuesday on the Facebook page of West Point’s U.S. Military Academy, and it almost immediately went viral. Part of that is Idrache’s background: He worked his way through one of the nation’s most prestigious military schools after immigrating to the United States from Haiti, earning his citizenship and serving for two years as an enlisted soldier with the Maryland Army National Guard, according to Army records. On West Point’s Instagram page, he left another message thanking people for their support. Bryant, the photographer, “captured a moment that I will never forget,” Idrache said. He credited past generations of soldiers and Capt. Kristen Griest, 1st Lt. Shaye Haver and Maj. Lisa Jaster, the three West Point graduates who last year became the first women to graduate from the Army’s grueling Ranger School. The third thing Idrache thought about, he wrote, is his future. Shortly after he leaves West Point, he will report to Fort Rucker, Ala., to start flight school. Idrache was a leader in his class of 950 cadets. According to a West Point news release, he was named a regimental commander last summer. Army officials at West Point said that he was on leave and not available for comment, but Idrache said in an Army news release Wednesday that he grew up in Port-au-Prince watching U.S. troops perform humanitarian missions in his native Haiti. He became West Point’s top graduate in physics, earning the school’s Brigadier General Gerald A. Counts Memorial Award. Idrache’s father, Dieujuste, immigrated to America and was able to bring the rest of his family with him in 2009, one year before an earthquake leveled much of Port-au-Prince. The family didn’t have much, Idrache said, but his father always stressed the importance of education. “My dad always said, ‘Education is the only gift I can always give you, because I don’t have any anything material to give,’” Idrache recalled in the Army news release. Idrache enlisted in the Maryland Army National Guard in 2010, serving for two years in the 231st Chemical Company with headquarters in Greenbelt, a suburb of the nation’s capital. The Army said his hometown is New Carrollton, east of Washington. He chose to become a pilot because it seemed like something he never would have been able to do without West Point, he said. This story was updated Thursday with information provided in a Maryland Army National Guard news release.